Author of “The Little Nugget,” “The White Hope,” etc. WHAT is the art of writing? Simply, when you boil it down, being able to put plain statements in an uncommon way. The men who make the money get it for having the sense to think out a new way of saying commonplace things in advance of their trade rivals. But hand the same subject to the giants of the craft, and watch them get busy on it. Mr. Arnold Bennett would treat it as a trilogy. Vol. I, Jones’ childhood. Vol. II, Jones, after a manhood in the Potteries, comes to New York. Circumstances bring him to Thirty-third Street. Vol. III, Jones crosses Thirty-third Street. Result, dollars per word, and instant sale of dramatic and moving picture rights. Sir A. Conan Doyle would have Jones drop the Maharajah’s Emerald under the elevated or pick up a paper covered with cipher writing, and Sherlock Holmes would have The Mystery of Thirty-third Street on his hands. Mr. Robert W. Chambers’ Jones (an extraordinarily handsome man) would meet a deliriously beautiful girl just where the up-town traffic gets you when you try to dodge the down-town traffic, and they would be married in the street opposite Macy’s. 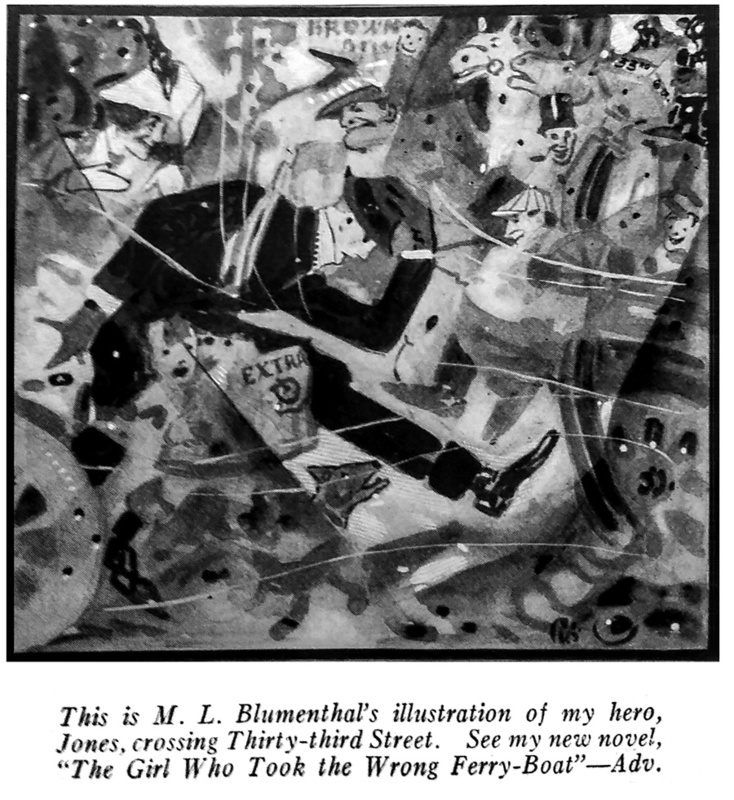 If Jones crossed Thirty-third Street under the guidance of Mr. E. Phillips Oppenheim, the traffic cop would turn out to be the Missing Ambassador whom everybody thought had been blown up by Nihilists. Different, you see, in every case. That is the secret. That is why authors have gold bath-tubs, and are able to afford eggs for breakfast. I am going to have them too. For I have invented a new form of literary expression. MY SECRET is simple. I can afford to give it away, because I have three crates full of manuscripts of the new literature in my sitting-room, and shall have flooded the market long before these lines appear. I have invented the Futurist novel—a complete novel in eight pages. In these complex, hustling days, if authors are to be true to life, they must put far more into their descriptions of every-day life and action than they have dreamed of doing hitherto. The Futurist painters have realized this, and they make it their aim to put everything into their canvases which space will allow them to cram in. It is the old principle of the Irish Stew. Broadly speaking, you cannot go wrong, whatever you put into an Irish Stew; and I, a futurist, hold that this rule applies also to novels. And so it is with the Futurist school of art. Where the old-fashioned artist painted a child playing with a dog, and let it go at that, the futurist now uses the figures of the child and dog simply as a basis upon which to build his emotional work. According to him, the older picture only contains half of the subjects, the material half. It merely represents two objects, which so far as they mean anything futuristically, might just as well be a bunch of bananas and half a grape-fruit. The futurist knows that both the child and the dog receive many impressions while playing with each other and he tries to record them. For instance, the child and the dog in attitudes of play, the child’s impression of the dog’s teeth, bark, wagging tail, eyes, and all other objects, animate and inanimate, that immediately surround him and the dog. The child also thinks a little about his nurse, his rattle and his impending dinner, or supper, as the case may be. So much for the child. The impressions of the dog are also represented on canvas. For instance, a bone, an open fire, the child’s bottle and a bird’s-eye view of a cat, as the dog is probably thinking of his favorite sport. By this method, you see, the futurist makes a picture that represents not merely a stuffed child playing with a stuffed dog, but a living, impressionable child with a living, impressionable dog. It is really very simple when you know how to do it. 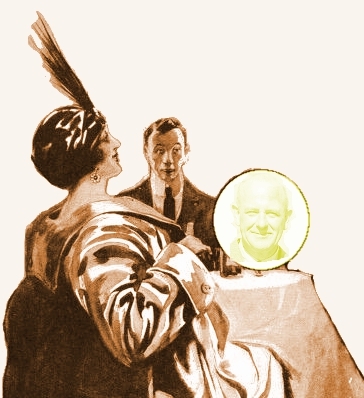 Now what the futurist has done for pictorial art I am going to do for literature. I read what I have written, and it seems so absurdly simple that I can scarcely bring myself to insult an intelligent public with explanations. However, as it may be that here and there an isolated individual will be found incapable of apprehending even the most limpid prose, I will explain. It is Jones crossing Broadway at Thirty-third Street again. Jones is the hero of my novel. He is a young and wealthy New Yorker, and he is impelled to cross the road by the same motives which, in similar well known circumstances, actuate a chicken. We start off with Jones. Nothing obscure about that? All clear so far? Very well, then. Just as Jones steps off the side-walk, he cannons into a stout man from Hackensack, who is visiting New York because his wife has gone to Philadelphia to sit at the bed-side of a girlhood’s friend who has contracted mumps through kissing her sister’s little boy. If that can be better expressed than by the word “Zunk,” I shall be surprised. Jones then begins to cross the road. “Whoosh.” An automobile just misses him. “Wow,” he exclaims. Then, pulling himself together for the effort, he says, “Now. Ah!” and resumes his journey. “Clangclangclangclang” An ambulance wagon shaves his trouser-leg. He exclaims “Wow,” then, mopping his forehead, “Whew.” “Woof,” a rushing pedestrian has bucked center and nearly upset him. He begins to say “Kindly look where you are going, sir,” when “Brrrrrrrrrrrr,” an elevated train drowns his voice. AND now the action begins to quicken, the plot to thicken, and the subscribers to get their money’s worth. As the noise of the elevated train dies away, he hears a clear, girlish voice enquiring of the policeman, “Where do I——?” It is Jacqueline, the most beautiful girl outside an all-fiction magazine. He gazes at her ardently. Has he met his affinity? “Whoosh.” Another automobile just misses him. He cries out in a startled voice, and his thoughts are distracted from the girl, so that he hears a news-boy calling the extras. Another elevated train passes overhead. He looks up Broadway, and sees a sign advertising Brown’s Balsam for the Bilious. “Wha-a-aaaa!” A surface-car comes to a halt beside him. He looks to the right, and sees the Herald Building, which suggests printing-machines to his mind. As he stands there, a dog runs past, yelling, and at the same moment his eye is caught by the Herald Square Moving-Picture Theatre. Another automobile whizzes by. Then a cry of rapture escapes him. Through the throng he has again caught sight of Jacqueline. This time he is in no doubt. She is his affinity. He gives her the burning stare, and as he does so, oblivious to all else but her, along comes a fire engine and rams him squarely. The crowd cries Hi! With one loud exhalation he falls unconscious. And there you are, with the heroine on the stage and the action moving like the Twentieth Century Limited; and all in half-a-dozen lines. My invention is the compressed soup tablet of literature. In a busy age like this it supplies a long-felt want. It is vivid. It grips. It has the punch. It has come to stay. How humanity has got along without it all these years is more than I can understand. It is ridiculously easy. Try it yourself. Here is one about a smart dance in New York. Anybody can see the whole picture. My futuristic literature is going to make me very rich. Of this I am so certain that I have already been at great pains to choose the colors for my automobiles. I shall never go out with less than three motors. Then, if the one I am in has a blow-out, I can get into the next, and go on without waste of time. The word will go round that I am out with my motors and tired business men will rush to their windows and envy me. I am now at work picking out names for my butlers. That is a little more difficult than picking colors for my motors, since no two can be alike.